If you didn’t take advantage of Prosper’s $104 giveaway in April you are in luck. You may well find the June promotion to be even better. As of yesterday, Prosper is giving away an iPad2 to new investors who invest $20,000 or more. Now, if you don’t have $20,000 to invest don’t despair. There are two other gifts at lower investment levels. If you invest $10,000 you will receive Bose® QuietComfort® 15 Headphones or at the $5,000 level new investors will receive an iPod nano. * This offer applies only to new Prosper lenders who (i) open a Prosper investment account between June 13, 2011 and June 30, 2011, and (ii) satisfy the following investment thresholds byJuly 31, 2011: 1) $5,000 to $9,999 for an iPod Nano, 8 GB ; 2) $10,000 to $19,999 for a set of Bose Noise-Cancelling Headphones, and 3) $20,000 or more for an iPad 2 32 GB WiFi model. Only investments that become funded Notes by July 31, 2011 will be counted towards the investment thresholds. 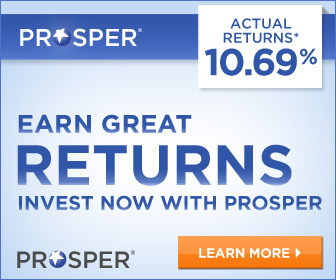 Prosper reserves the right to terminate this offer at any time and to refuse or recover any promotion award if it determines that the award was obtained under wrongful or fraudulent circumstances, that inaccurate or incomplete information was provided in opening the investment account, or that any terms of the Lender Registration Agreement have been violated. Invested funds may also be used to qualify for Featured Listings promotions, but otherwise such funds cannot be applied to other promotional offers. Limit one promotion award per customer. All promotion awards will be ordered by August 26, 2011 for delivery to the lender’s address on file. Promotion awards are subject to availability and quantities may be limited; Prosper reserves the right to substitute an Apple Store gift card of equal value. Lenders who receive promotional offers from Prosper may be subject to IRS Form 1099-MISC reporting requirements should the total value of those items exceed $599 in a calendar year. Please consult a tax professional. Neither Apple Inc. nor Bose Corporation is a participant in or a sponsor of this promotion. iPad and iPod are registered trademarks of Apple Inc. Bose and QuietComfort are registered trademarks of Bose Corporation. So if you are on the fence and you have a sizable amount of funds to invest now would be a good time to get started. The offer is good through June 30th.